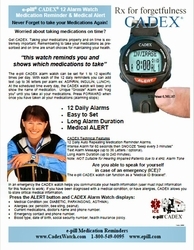 Home > Medical / Clinical Studies > Diabetes Management: Diabetes Studies / Medication Compliance / Patient Adherence > Diabetic ALERT Bracelet concealed as a Watch (Wristwatch) > Medical Conditions: Who should be wearing a CADEX Alarm Watch and ICE Medical Alert? > What is CADEX Reminder? LEARN about Alarm Watches, Pill Boxes, Medicine Timers and Pill Dispensers. Avoid Medication Errors and Feel Better. 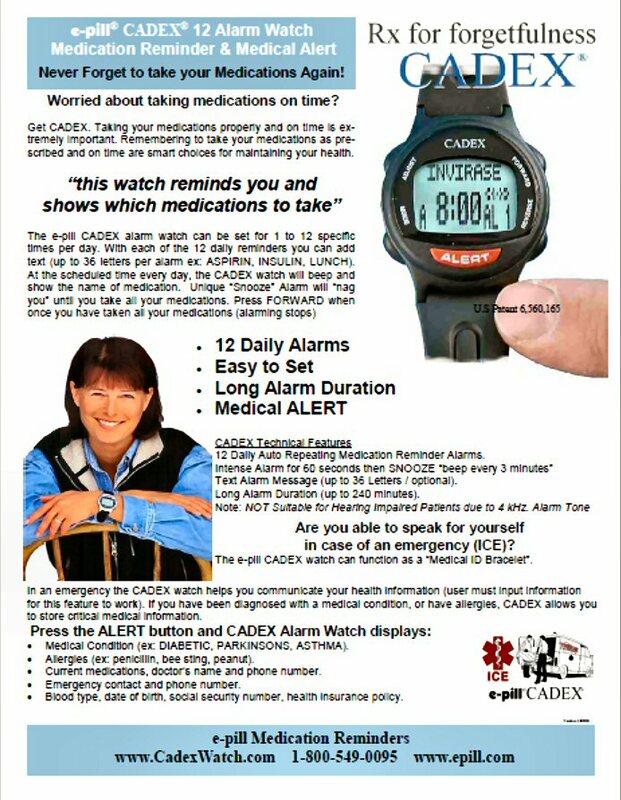 The CADEX Alarm Watch inventor tells the story about how she invented this e-pill Medication Reminder. We offer a complete line of medication reminders: Pill Box, Medication Dispenser, Medicine Timer and Alarm Watch. Alarm Watch with 6, 8 or 12 Daily Alarms. Pill Dispenser that beeps, talks or vibrates. Locked Automatic Pill Dispensers for Home use. Pill Boxes with 4, 5 or more daily doses. Pill Organizers for 1, 2, 3 or 4 weeks.